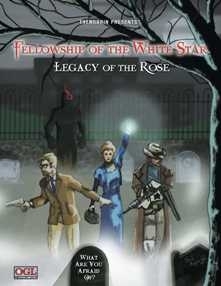 DetailsÂ the Fellowship of the White Star campaign, which is set in semi-historic earth 1905-1914 with a horror atmosphere that is hidden from the view of the common people. In this version of earth, magic still exists in a limited form and the players will create heroes to investigate suspicious events and battle evil supernatural foes and their malevolent plots.Â 351 pages including new skills, feats, classes, prestige classes and more. Envision western cowboy heroes battling zombies in mines, archeologists investigating tombs in Egypt, British soldiers weeding out voodoo cults in Jamaica, Arctic explorers seeking out the Yeti, City detectives investigating strange crimes, etc... It is an ongoing campaign that focuses on role-playing, investigation and horror.Â That isn't to say there isn't combat, it just isn't the primary focus. The 1905 campaign year ended on 12/31/08 and we had 23 modules for it that were set inÂ Russia, Japan, Roumania, France, Gibraltar,Â England, Africa, AustraliaÂ and the good 'ol USA.Â Players interacted withÂ historic figures such as Rasputin, Henry Ford, JP Morgan,Â Tsar Nicholas, Cochise, and Mata Hari.Â There are 20 modules for 1906 (several revolving around the San Francisco earthquake)Â and 11 for 1907 so far (several dealing with the financial crisis in America).Â Modules areÂ sold separately from the campaign book. The game was reviewed in "Knights of the Dinner Table" issue #131 in the Brian's Small Press Picks column where it was rated as "Horror in History done right". This title was added to our catalog on January 28, 2009.